enbridge how long will this pipe repair last? luxury yacht manufacturer, used its expertise in lightweight materials to transition into wind turbine manufacturing. alike. A total of 54 clean energy projects were announced in Democratic districts and 70 in Republican districts. Where is Albion in this mix ? MISSION Provide leadership and practical solutions to ensure a prosperous community that will sustain healthy lives for our citizens and a healthy local environment. PURPOSE To facilitate information and education of new green practices and products to and for our members and the public. WHO ARE WE? A group of local citizens working to inspire individuals and organizations – both within and outside City government – to take actions and implement polices that help make Albion a model of health and ecologically sustainable living. A group of local residents working with City government, business groups, nonprofit organizations, and other partners to protect and enhance Albion’s distinctive environmental quality and livability. SPECIAL INTERESTS To promote green building by increasing public and professional knowledge and awareness of the benefits of green construction practices. To provide recommendations and encouragement to the City of Albion in the implementation of a local action plan for climate protection and sustainability that is crafted to be forward thinking and targeted to the unique climate and circumstances of Greater Albion. Albion’s Green Team is studying best practices in our community, the country and around the world. Together we can make a difference by implementing big ideas and small changes in the way we interact with our environment. With visionary leadership, persistence, and a strong message, this new way of life can become second nature to us all. Most of all, there is a need to understand how important these things are to Albion. Methodism was organized into a conference in the year before Michigan became a state. Your input is needed to help us plan for the future. There is no reason for you to take anything too seriously right now, so lighten up! Every argument has two sides, and you should accept the fact that everyone has his or her own perspective on things. Now that Albion has a energy and sustainability committee we need to keep this alive, regroup, move forward with positive thinking, not looking at what is not possible, but to approach it, work it, and do it, and find the resources to get it done. 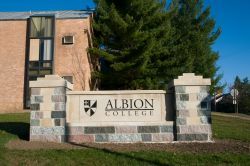 Albion should embrace having Albion College here and not fight within. Work to provide a supportive community, all working together for change. The purpose of the community is to flourish and prosper in the 21st century. Provide the most up to date education, keeping students here providing the education and tools they will need in their life to prosper. Using positive forward thinking and working together providing the foundation they will need, using inside assets and talent from the community, working all as one. Any comments can be made by linking into sustainabilty under local to the right. Is it too hard to go to the moon, eradicate smallpox or end apartheid? Is it too hard to build a computer that fits in your pocket? No? Then it's not too hard to build a clean energy future, either. Genetically Modified Food: Is it safe to Eat Genetically Modified Crops? Life takes on meaning when you become motivated!